Happy Friday, today is the first Friday of September, you know what that means, a brand new Challenge! 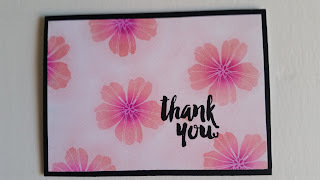 First, we have the gift certificate winner and our top projects to announce from Friday Challenge 66 - "Create Flowers!" There were some absolutely stunning entries. Thank you for playing along and sharing your inspiration with us! We just love to see what you create! The weather is changing and we have something special to you!!! 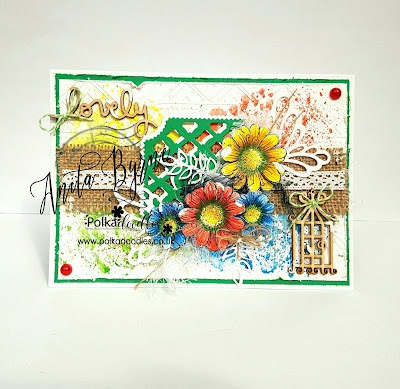 Martha Lucia is here to present to you the theme for this month: we will be using stamps and embellishments! Any kind of embellishments: ribbon, baker's twine, die cuts, rhinestones, lace, you get the idea! Cut the base of the card. Cut a layer using the green side of Earth Wind Fire 106 (coming soon). Cut a third layer using a big scallop die cut border using the beige side of Urban Oasis 103 (coming soon). Cut a fourth layer using the dark blue side of Earth Wire Fire 107 (coming soon). Paste the second and third layer over the card base. Tie a few loops of baker's twine around of the fourth layer and and create a bow with the ends. Cut a Curly Butterfly using a piece of Whistlin Dixie 108 and paste over the sentiment using glue dots. 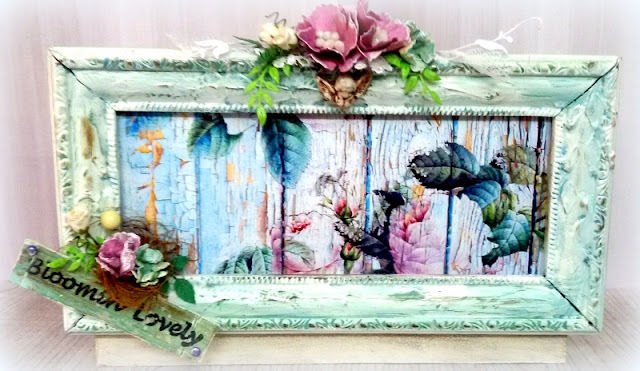 Finalize the decoration by adding some blue rhinestones. This month's challenge theme is "Feature Embellishments". 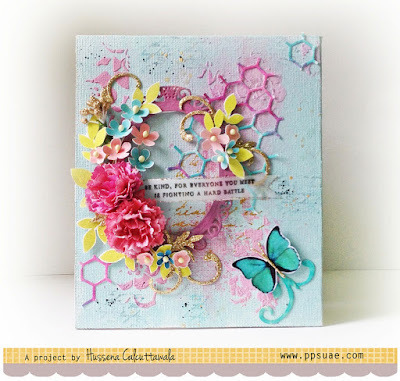 Create a layout, card, tag or off the page project using embellishments as your feature of your design - be creative! Yay!! So excited to see I was the winner of the challenge!! Thanks so much and congratulations to the top 3 winners! Thank you so much for such a fun challenge! Your inspiration card is gorgeous! I am happy to join you this month. I have featured 3-D flower and butterfly sequins as my embellishments and I've used 8 in total. Thanks for the inspiration! Congrats to the winner and picks from the last challenge - beautiful work, ladies! Thank you for the fun challenge. I have used a few die cuts (manual and machine cuts), a bit of bling, old alphabet stickers, a bit of twine you can't see in the pics and pictures of my county fair blue winning cards.